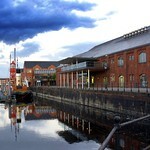 The new National Waterfront Museum charts the passage of Wales' history of industrial revolution and innovation. 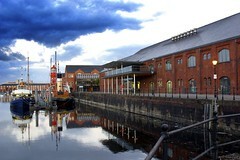 The building was created by a merger of the old Grade II listed Maritime Museum, and a modern slate and glass extension, and by combining significant historical artifacts with modern technologies, such as interactive touchscreens and multimedia presentation systems, they have created a beautiful modern museum 'for people who don't do museums'! The local produce market at the National Waterfront Museum only started in early 2007, but has proved a great success, encouraging those who don't want to venture further afield. It's also great news for those of us who are too busy on Saturdays or can't get to the covered market on Saturdays, since the market is open from 10am - 4pm on Sundays, giving plenty of time to wake up a little later and stroll down to the Marina then amble between the museum and the craft and produce markets. You'll find some of the stalls inside the Waterfront Museum, and most have the option to move indoors if its bad weather - it' almost like the place was built to have markets! The southern wall of the new exhibition hall is faced with three types of Welsh slate. These were quarried at Bethesda and Ffestiniog. The variation in width of the bands of slate echoes the geological strata from which it came. Using local materials reduces the amount of embodied energy in construction, reduces the distance it has to travel, and helps keep money in the local econmy.